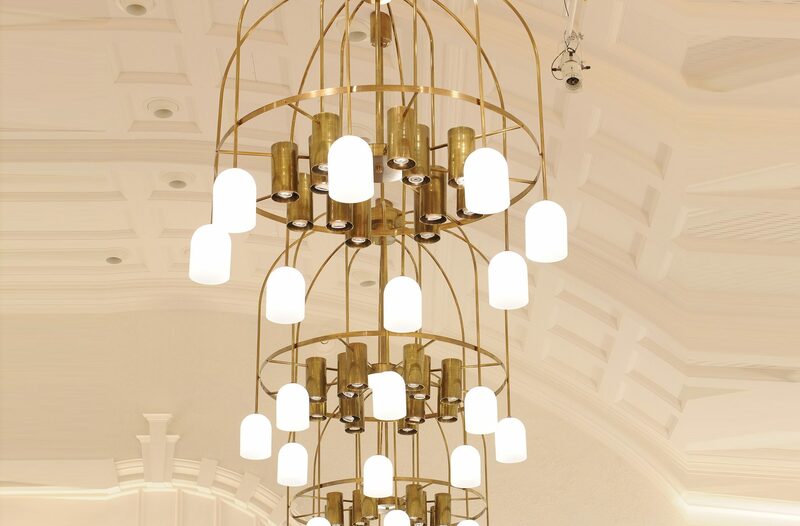 Six spectacular brass chandeliers from Dernier & Hamlyn are playing a major role in the transformation of the Concert Hall at the Royal College of Music. Over the years, many changes have been made to the interior of the College in the name of modernisation. Recent works have been focused on taking advantage of technological advances, while restoring the Concert Hall to the best of its historic past. This has included reinstating the entirely lead white painted interior, specified by Sidney Smith, and dismantling and reassembling the roof to improve the ventilation and acoustics. However, a visually stunning enhancement to the Concert Hall is the brass chandeliers, which were designed by architects Darntonegs and manufactured in our Croydon factory.